Thirteen New Jersey microgrid projects won state funding for feasibility studies in late June. Here are details of their plans, supplied by the Board of Public Utilities, including the incentive amounts, time expected to complete the feasibility studies and description of the microgrid projects. Atlantic City’s microgrid plan calls for an additional combined heat and power (CHP) unit at the ACM Energy’s Midtown Thermal Control Center (MTCC) to support critical facilities. Those facilities include Atlanticare Regional Medical Center, Boardwalk Hall, and Caesars/Bally’s Hotels and Casino. The MTCC currently provides chilled water and steam to customers for cooling, heating, domestic hot water and kitchen use. Its existing CHP unit provides thermal energy to several hotel, casino and public buildings. The new CHP unit would provide an additional 7.5 MW, along with thermal energy, to critical facilities, microgrid participants and other customers. The microgrid would achieve cost savings by reducing peak power demand and electric generation. Camden County, along with the Camden County Municipal Utilities Authority (CCMUA), proposes a community microgrid in Camden City. The project would connect CCMUA with Covanta to allow the two facilities to exchange electrical and thermal energy during emergency and non-emergency times based on the needs of CCMUA and its connected microgrid community partners. The interconnection of the two facilities will allow Covanta to replace its use of potable water with treated wastewater for its power production operations, as part of a sustainability loop. Using the treated wastewater supply this way would reduce stress on the local aquifer system. Other facilities that will benefit from the microgrid include Camden Housing Authority, Riletta Cream and H.B. Wilson Elementary Schools, New Village Supermarket, Fellowship House, Fortunas, and Citgo Gas. The microgrid feasibility study will evaluate the technical and financial viability of providing DER to most if not all of the study areas’ electrical needs while using excess heat from the Covanta WTE facility to offset thermal loads of the CCMUA. In turn, water from CCMUA could be used to decrease Covanta’s potable water use. This self-sustainable system would also provide continuity of operations to critical public safety infrastructure (shelters, police, fire and medical) during times of natural or man-made disasters. The estimated time to complete the feasibility study is 12 months. Cape May County (CMC) Municipal Utilities Authority (MUA) proposed a microgrid project that would utilize a syngas/biogas/natural gas fueled CHP unit at CMC MUA’s Seven Mile Beach/Middle Wastewater Treatment Facility (WTF). Syngas/biogas will be generated on site and turned into electrical and thermal energy on site from the supply of wastewater bio-solids. Natural gas will be needed as a supplementary fuel. In addition to supplying electrical and thermal energy to the WTF, this project will also supply energy to several critical facilities in the Crest Haven Complex which includes the CMC Prosecutor’s Office, CMC Correctional Center, CMC Sheriff’s K9 Unit, Police and Fire Academies, CMC Administration Building, CMC Health Department, CMC Road and Bridge Department, fueling station, Crest Haven Nursing and Rehab Center, Special Services School, Technical High School, NJ Army National Guard Armory and few others. Galloway Township’s proposal will examine the potential of using a town center microgrid to connect the Galloway Town Hall and police station, AtlantiCare Regional Medical Center, two assisted living facilities, Stockton University, Reeds Elementary School, Roland Elementary schools, Galloway Middle School and Absegami High School and a ShopRite. The preliminary estimate of energy production represents approximately 47,000,000 kWh and 1,400,000 therms. The applicant will evaluate most commercially viable technologies, such as fuel cells, energy storage systems, solar, CHP thermal loops and water exchange systems. The Borough of Highland Park submitted an application entitled Being Resilient In Temporary Emergencies (BRITE) Highland Park TC DER Feasibility Study to examine the potential of connecting the borough hall, police and fire stations, two senior centers, the housing authority, the Bartle School and Board of Education Offices. The preliminary estimate of energy production represents approximately 1,349 MWh and 52,248 therms. Additional sites may be evaluated for potential inclusion in the TCDER Microgrid. The applicant will evaluate most commercially-viable technologies, including but not limited to fuel cells, energy storage systems, solar, and CHP. 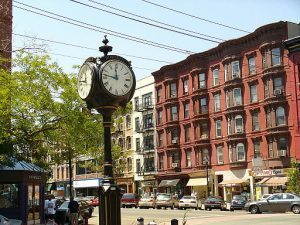 The City of Hoboken filed an application for a feasibility study to examine the potential of connecting the critical facilities that include Hoboken Fire Company 3, Police Headquarter, City Hall, the Hoboken Homeless Shelter, St. Matthews Church, as well as St. Peter and Paul Church, Kings Grocery, municipal garages B, D & G, multiple senior housing facilities, the YMCA, two local pharmacies, three Hoboken Housing Authority Properties (Andrew Jackson Gardens, Harrison Gardens, Adams and Monroe Gardens) and pump stations. The applicant will evaluate most commercially-viable technologies, including but not limited to DER, energy storage systems, solar, CHP thermal loops and biodiesel fueled generators. Hudson County submitted an application for the proposed Hudson County Advance Microgrid (HCAM) to be located in Secaucus Township. The HCAM project core partners include Hudson County, the Township of Secaucus, the Secaucus School District, Secaucus Housing Authority, Meadowview Hospital and Alaris Health at the Fountains. The [roject’s critical facilities are centered around the Meadowview Complex, which contains multiple critical facilities including the Meadowview Psychiatric Hospital and Hudson County’s Juvenile Detention Center, Hudson County’s 911 Call Center, multiple Hudson County office buildings, Alaris Health at the Fountains, Secaucus Housing Authority, and the Secaucus Town Hall and Police Department. The feasibility study will evaluate the most commercially-viable technologies, including but not limited fuel cells, solar and dispatchable generation such as CHP and other new electric infrastructure to allow the proposed project to operate during normal and emergency conditions. The Township of Middletown submitted a feasibility study application with the core partners of Middletown School District, Middletown Sewage Authority, Monmouth County, NY Waterway and Earle Waterfront. The proposed project would include the critical facilities of NWS Earle Waterfront Administrative Area, Township of Middletown Sewage Authority (TOMSA), NY Waterways Ferry Terminal, Middletown Public Works and CNG Fueling Facilities, Middletown Municipal Complex, Public Schools, Bayshore Middle School, Leonardo Elementary School, Bayview Elementary School, Monmouth County Highway Department, Middletown Fire Stations 3, 4 and 7, and Monmouth County Bayshore Outfall Authority. The study will evaluate the new power generation capacity needed; estimated to be between 30 to 50 MW. The Township of Montclair submitted an application for the Montclair Town Center Microgrid with core partners including the Montclair School District, United Methodist Communities, New Jersey Transit and Hackensack UMC – Mountainside Hospital. 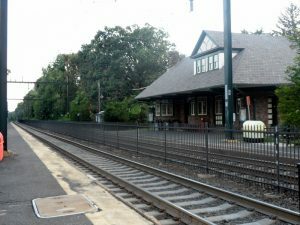 The project’s critical facilities include the Montclair fire department headquarters, Glenfield Middle School, Pine Ridge Senior Living housing, Mountainside Hospital and New Jersey Transit Bay Street Station and Garage. Several other public building and private sector businesses were identified as potential sites. The study will evaluate about 2.3 MW of new power capacity, which may include solar and dispatchable generation such as CHP, battery storage and other new electric infrastructure to allow the proposed project to operate during normal and emergency conditions. Additionally, the study will evaluate both Siemens SICAM and Johnson Controls Grid Connect microgrid control/communications systems. Neptune Township submitted an application for a feasibility study for a Neptune Township Advanced Microgrid (NTAM) with partners including the Neptune Township School Board, Neptune Township Housing Authority, Monmouth County and several private sector entities. The NTAM critical facilities include the Jersey Shore University Medical Center (JSUMC), Monmouth County Academy of Allied Health & Science, Meridian Dentistry for Children, Pediatric Associates, Neptune Municipal Building (including the Police Department and Library), Neptune Department of Public Works, Gables Elementary School, Neptune Middle School, Brookdale Community College, Monmouth County Vocational School, Neptune High School, Neptune Aquatic Center, County Sheriff Backup Communications Center and Emergency Medical Squad Training Center, Neptune Senior Citizens Center, Neptune Housing Authority, Employment Services, U.S. Post Office, senior housing, DaVita Neptune Dialysis Center, Excelsior Medical Corporation, Walgreens, Neptune Getty Station, ALDI Supermarket, Neptune Township Sewage Department and Wastewater Treatment Facility, New Jersey American Water Company, Monmouth County Emergency Communications Tower, Shark River Hills Fire Company, Shark River Hills First Aid Squad, and the Neptune Township Housing Authority. The study will evaluate the proposed project using an existing 3.8 MW CHP facility at the JSUMC. Also to be evaluated is approximately 15 MW of new power capacity which may include solar and dispatchable generation, such as CHP, and other new electric infrastructure to allow the proposed project to operate during normal and emergency conditions. 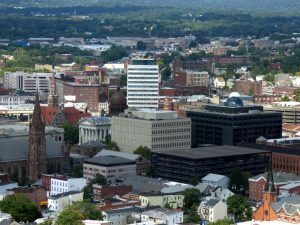 The City of Paterson submitted an application for the Great Falls Eco-Energy Resiliency Project along with core partners including Passaic County and the City of Paterson School Board. Potential partners include the US Government Service Administration (GSA), Saint Joseph’s Medical Center and the Children’s Hospital. The critical facilities to be served include Paterson City Hall, Health and Human Services – Community Development Office, Paterson Recreational Offices, Paterson Fire Department Headquarters, Paterson Police Department, Paterson International High School, JFK High School, Passaic County Jail, Passaic County Courthouses, Passaic County Administration Buildings and Passaic County Social Services. Other potential critical facilities include Hinchliffe Stadium, the US GSA Federal Building, Saint Joseph’s Medical Center and Children’s Hospital. The existing generation technology for the proposed project is the Great Falls Hydro-Electric Generation Plant (Great Falls). The Great Falls can generate between 3.5 to 7.0 MW of power depending on water flow. The additional capacity could be provided through new power which may include solar, dispatchable generation such as CHP, new distribution assets, storage, and other new electric infrastructure to allow the proposed microgrid to operate during normal and emergency conditions. 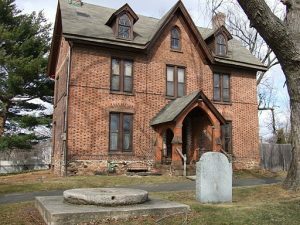 The N.J. Department of Treasury, Division of Property Management and Construction, filed an application with core partners include the City of Trenton, Mercer County and the Mercer County Improvement Authority for a feasibility study for the proposed Downtown Trenton Microgrid. Critical facilities include N.J. Justice Complex, N.J. State House, N.J. Treasury Taxation Building, N.J. Department of Labor Building, N.J. Department of Health Building, N.J. Department of Community Affairs – Ashby Building, N.J. Department of Human Services – Capital Plaza One Building, N.J. Department of Environmental Protection Building, N.J. Treasury – Mary Roebling Building, NJ Motor Vehicle Commission Building, NJ Network Building, Old Barracks, Thomas Edison College and the NJ War Memorial. Based on the list of partners and proposed critical facilities the NJ State Capital Complex would be a FEMA category IV designated facilities and there are four FEMA category III facility within 0.5 miles that can provide shelter in an emergency as well as several critical data storage facilities such as the Justice Complex, Labor and Taxation. There are several FEMA category III facilities that have a combined energy usage of greater than 90,000 Btu’s per square foot and the Project’s estimated overall electrical usage is 63,300 Btu/ square foot. The estimated total annual electricity usage is 86,505,508 kWh and the thermal load is provided by Veolia’s Trenton Thermal Energy District Network (“TEDN”). The existing Trenton TEDN would be the hub technology of the project. The existing CHP/district thermal facility provides 13,000 tons of chill water capacity and 132,352 pounds per hour of steam/hot water to approximately 35 customers in the central business district of Trenton. The additional capacity could be provided through new power which may include solar, dispatchable generation such as CHP and other new electric infrastructure to allow the proposed Project to operate during normal and emergency conditions. The project will include a fully customized microgrid controller that would include the ability to balance load and generation and include smart grid and advanced metering infrastructure. The Township of Woodbridge submitted an application for a feasibility study for a proposed Woodbridge Town Center Advanced Microgrid (WAM) with core partners including the Woodbridge School District, Woodbridge Housing Authority and a number of private sector companies. The critical facilities would include the Woodbridge Town Hall/Police building, fire department building, Stern Tower Senior Living, Adams Tower Senior Living, Finn Tower Senior Living, Pump Station, Ross Street Elementary School, Mawbey Street Elementary School, Woodbridge Middle School and several private sector businesses. The study will evaluate new power capacity which may include fuel cells, solar and dispatchable generation such as CHP and other new electric infrastructure to allow the proposed microgrid to operate during normal and emergency conditions. 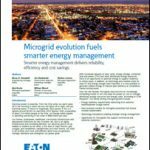 Track news about microgrid projects by joining our LinkedIn Group, Community Microgrids and Local Energy.